Closed-circuit TV camera's and video systems are deployed in public places such as the airport, train and bus stations for security purposes. The authorized personnel then go through the generated footage manually to identify possible threats. To partially automate the process, researchers at the University of Granada, Spain have developed a system that can recognize and notify the use of guns in a video. The method appears to be yet another application of object recognition technology, which has been around for quite some time now. Taking it a step further, the artificial intelligence built in this system makes sure it learns from its behavior and improve itself over time. The sampling rate of the system is five frames per second - as good as analyzing the video footage in real time. 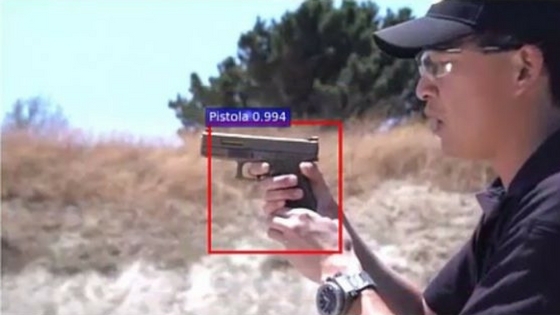 Whenever the system recognizes a gun, it produces an alert sound along with surrounding the weapon with a red box on the screen. When tested on low-quality videos of movies such as Mission Impossible, James Bond, and Pulp Fiction, the system was accurate around 96 percent of the time! Social media sites like Facebook, Twitter, and YouTube can make use of this system to prevent violent content on their portals. There is always a glimmer of hope, and technology can turn it into reality. Watch the system in action in the video below. If you do not understand Spanish, enable and convert the subtitles in a language of your choosing.